This document is a 40-page handwritten volume containing outgoing letters and legal opinions of John Beverley Robinson while he was Acting Attorney General during the War of 1812.1 The letterbook shows John Beverley Robinson at the beginning of an influential career. Copying letters was his way of keeping a record of his correspondence and represents the nineteenth-century equivalent of an outgoing e-mailbox. He wrote by hand not only the letter itself, but the letterbook copy too. Born in Quebec in 1791 to a family of loyalist heritage, John Beverley Robinson was educated at Bishop Strachan’s school. He began to study law in 1807, and was articling with the Attorney General of Upper Canada, John Macdonell, when war broke out in 1812. 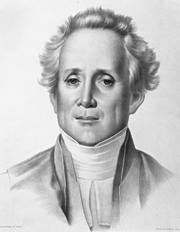 After Macdonell was killed in June 1812, Robinson was named Acting Attorney General. He was a mere 21 years old at the time. He was not even qualified as a lawyer. He held the post for about two years. The responsibilities of the Attorney General at that time were important. The Attorney General provided the government with legal opinions on a variety of issues and before the advent of Crown Attorneys in 1857, personally handled the crown prosecution of criminals. During the war Robinson prosecuted a number of people for treason, and some of them were hanged after their convictions. After the war, Robinson was called to the bar in Upper Canada in 1815 and in England in 1823. Upon becoming a lawyer he held the position of Solicitor General of Upper Canada, and then served again as Attorney General from 1818 to 1829. In 1829 he became Chief Justice of Upper Canada. Robinson is possibly best remembered as a member of the notorious “Family Compact,” the small Toronto elite that ruled the colony for decades. Robinson died at Toronto in 1863. The letterbook has been transcribed as closely as possible to the original. Words which are abbreviated in the text have been left as they appear in the original. It is not always possible to tell which nouns Robinson capitalized, but efforts have been made to follow the original text. Any words which might be in doubt are followed by a question mark. Where the text in the original letterbook was underlined, it appears here in italics to more clearly distinguish those phrases from others which are linked to the glossary. 1 A microfiched copy of this journal forms part of the John Beverley Robinson Papers at the Archives of Ontario.